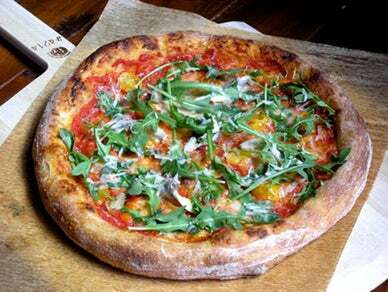 Stella Rossa Pizza Bar features a select menu of 12-13-inch artisan style pizzas highlighting a range of sustainable, locally-grown ingredients found at the Santa Monica farmer's market and sourced by nearby purveyors. Varieties include Margherita, Organic house made sausage, Bloomsdale Spinach and Purple Kale, Hand Shaved Mushroom and melted onion, among others. Their menu changes seasonally.